Keen as we are in our search for good mobile games, I recently decided to look at Honkai Impact 3rd. The charming anime visuals helped a lot in my decision, but games that look one thing and are a completely different beast are a dime a dozen, so I went with caution. Soon enough I found out that the main appeal of this game lies in its focused combat system, as well as in the tons of content on offer. And, of course, the virtual waifus on display. The value of waifus isn’t to be neglected, as you surely know, but for once these are a very real part of the game, and not a shady ploy to trick players into downloading it. Honkai Impact 3rd’s anime style looks quite a bit like the one from SoulWorker and is honestly one of the most inspired looks in my book. This game is available worldwide for almost a year and it remains as one of the best mobile titles ever created. The emphasis goes to the word ‘game’, as this is something that you can play and not a rushed cash-grab where you hit a paywall at every corner. It’s not that Honkai Impact 3rd does without all the sleazy in-app purchase encouragement tactics that plague most, if not all mobile games, but at least it comes with an actual game for you to play, enjoy, and eventually invest in. The developers deserve it, clearly a lot of work went into turning it into an enjoyable experience overall. Will You Be My Valkyrie? Honkai Impact 3rd is all about a war against the Honkai creatures, and for that an organization was created. This organization is comprised of cute female warriors, or Valkyries, which comes in handy as this is a game where eye-candy goes hand-in-hand with the exciting arena battles. 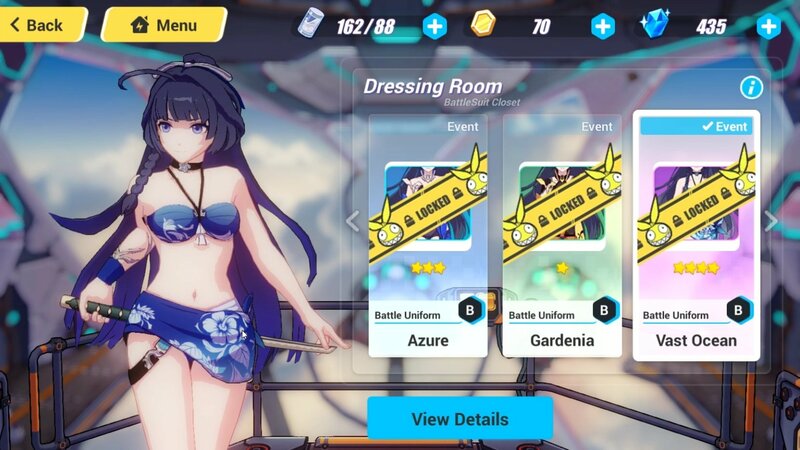 The first three Valkyries that you will recruit are Kiana Kaslana, Raiden Mei and Bronya Zaychik. Each one has a specific style, battlesuit and weapon, with a few alternative battlesuits and costumes to unlock. Other Valkyries are waiting to be unlocked as well, but it’s not uncommon to control some of them in alternative events, something that could give you an early taste of what they can offer in battle. Considering that it takes quite some effort to unlock new characters and costumes, this is a welcome twist. The battle system in Honkai Impact 3rd isn’t very common in mobile games. While the arenas may be small or divided into minor segments that open as you defeat the enemies, there is a real combat system at work, with player-controlled movement, polished mechanics and true skill always required. It is exciting, intense and fast, and hits its stride when you have your squad of three Valkyries ready and willing. As you change between them on-the-fly and maximize their abilities, you feel confident that you are in control and not just spectating as you do in most mobile games. There is an accomplished evasion system that leads into an opportunity to strike back, and each girl has a primary skill and ultimate ability to use. Often, you’ll get the chance to change your Valkyrie and create a succession of devastating combos. Needless to say, everything moves smoothly and looks really good, especially Kiana’s atletic spin. It’s energetic and fast-paced, with no time to blink, especially in those timed stages where every second counts. Occasionally you’ll get to fight alongside two other players, making for a squad of three going full co-op on your enemies. Later, you’ll unlock the adventure mode, unexpectedly throwing you into an open world filled with quests and tasks, adding to the richness of a game that already offered a lot in the first place. Such as, you ask? The dorm, for example. This is a place where you can hang out with your chibi Valkyries, upgrade their abilities (using the training machines, for example), and ultimately expand the dorm with more rooms and purchase different furniture and apparel to build an awesome place. You can also fiddle with the base, which is another place where you find buildings for several purposes, such as sending your team in expeditions or mine coins and other materials. There is no shortage of things to do in Honkai Impact 3rd, that’s for sure. And now I’ll delve into the things that will remind you of Honkai Impact 3rd's mobile roots. Valkyries can and should be upgraded through several means, resulting in an endless stream of options and back and forth between menus to get the best out of each character. There is a Gacha system as well, so you know what that means. It’s crucial to upgrade each Valkyrie’s level and combat power by choosing and upgrading their best weapons, Stigmatas and skills, as well as enhancing and refining here and there. Tons of different materials and currencies are necessary to do this, something that will require lots of patience and many days of playing and earning rewards just for checking in or doing nothing particularly special. You blink, you earn something – I’m exaggerating, but if you’ve played a mobile game before, you should get the picture by now. Amidst the materials and fragments that you frequently earn, Stigmatas are a case that deserves highlighting. Apparently, these are the spirits of fallen warriors and that is the clever excuse for all those lovely drawings of anime girls which I’m convinced many players will love to collect. Their practical use is to give your Valkyrie some boost or another, with three Stigmatas per character. You can get extra physical damage, health points or defensive boost, among other things, so these shouldn’t be ignored. Also, did I already tell you about those lovely and revealing character artworks? Of course, this is the kind of game that gets special events to keep players coming back for more – as if there wasn’t enough to dip your feet into already. But praise goes to developer Myhoyo for the obvious care and love that they have for their game. The recent Sweet Memories event is perfect proof of that, putting the Honkai fight in a secondary role as you, the Captain, get to see a different side of the girls and go on a date with the Valkyries. 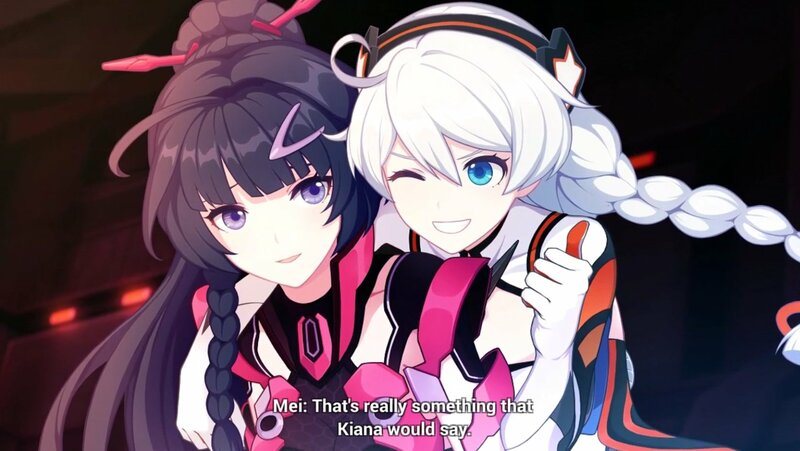 Honkai Impact 3rd: Love Simulator, you say? You’re not entirely wrong. You receive messages from the Valkyries in your phone and must choose a girl to focus on – as you accept one message, the others are automatically rejected. You build your relationships through means such as giving presents, increasing your trust points and unlocking new locations. A photo album is available to store your memories, and obviously there is a bit of fighting involved to go with the chatting and dating. It’s like a lite Dead or Alive Xtreme Venus Vacation, minus the volleyball… and the gratuitous display of female anatomy. Honkai Impact 3rd is one of the few real games that you can pick up for free for your mobile device. It still has some of the cash shop traps from this platform but manages to counter that with some true gameplay and stunning visuals. As far as mobile action games go, this one goes highly recommended.